I'd first like to say what doesn't rock, and that is having a mandatory day of attendance on a SATURDAY. Yes, I went to school yesterday and saw all my little buddies except the 3 that didn't bother coming. This week is Catholic Schools Week, so yesterday was the kick-off day. We had an awards ceremony and we went to Mass together and we had a spaghetti dinner. I have no idea how moms take little kids to church. We go every Friday with the whole school but my entire class has a 5th or 6th grade prayer partner who makes sure they are kneeling and standing and sitting at the right times and not poking people or kicking their neighbors. Yesterday... no prayer partners. Just me with all the kiddos. By the end I was ready for a nap. That takes some real vigilance. Today I am participating in a favorite picture book linky party! It is hosted by Happydally! 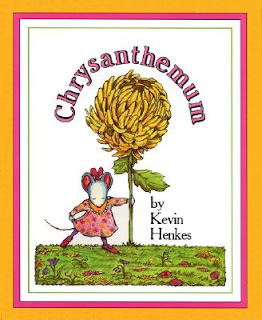 I love anything by Kevin Henkes, especially Chrysanthemum! Super cute. I read it on the first day of school and all the kids made text-to-self connections (before they knew what those were). Side note - Chicago area people, Kevin Henkes is coming to Naperville in March for a book signing. I want to go! Who wants to go with?? I super love anything by Mo Willems, and really it is hard to choose a representative that I super love the most. 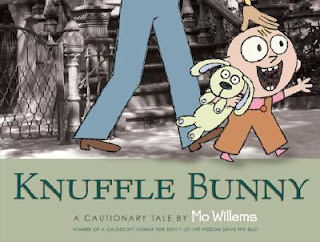 But since Knuffle Bunny was what introduced me to Mo Willems, I will pick that one! 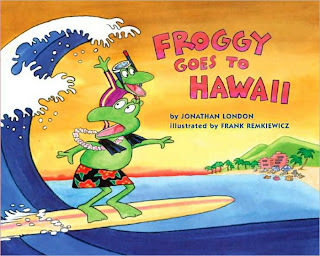 And lastly, I love me some Froggy! Part of Catholic Schools Week is a Scholastic book fair, and I put this Froggy book on my teacher wish list! It's only like $4 so I hope someone loves me enough to donate it!!! What are your favorites? I would love to find new read-alouds!!! My kiddos just are in awe of those books when they hear them and I just LOVE it! Have a great day! I just started collecting the Piggie and Elephant series from Mo Willems. They are great for early readers. I love Jan Thomas author of Rhyming Dust Bunnies. Press Here is great. I could go on and on. For more great book finds go here http://learningwithmrsparker.blogspot.com/2012/01/february-book-picks.html. Hope you'll link up these great books, too. HaHA! I managed to catch you and tag you. Come check it out at my blog! I LOVE LOVE LOVE Crysanthemum!! And Knuffle Bunny TOO!!!! My kids love Mo and especially pigeon. I can't imagine taking my class of 26 first graders to church with me. Makes me cringe just thinking about it, although I know that many of them haven't been to church so maybe they'd be so intrigued by the whole experience they'd be entirely well behaved! I tagged you in a post! Please check it out. Come on over and see what it's all about! Where Did All This Stamina Come From? Would You Care for a Pair of Pears? Clutter-Free Classroom Project: Week One!